KENYA (WASHINGTON POST) -- I finally went to see Ryan Coogler's "Black Panther," the latest superhero action blockbuster from Marvel Studios. It is a fantastically well-made movie, set to be one of the highest grossing movies of all time, putting it in a league with the likes of Steven Spielberg's "Jurassic Park" and George Lucas' "Star Wars." Based on the Marvel Comics character of the same name from the fictional African state of Wakanda, the most technologically advanced nation in the world but which apparently prefers to hide its light under the bushel of Third World country status, it has been praised for its depiction of an Africa not defined by colonization or by its relationship with Europe. Wakanda does not pose as a backdrop for white struggles and passions. "It breaks with the spirit of derision that has always saturated Hollywood films about Africa," gushes Brent Staples in The New York Times. However, the truth is the movie is little more than a marvel of marketing. Far from offering a "redemptive counter-mythology," as Jelani Cobb writes in The New Yorker, the movie trots out many of the same destructive myths about Africans that circulate the globe. At heart, it is a movie about a divided, tribalized continent, discovered by a white man who wants nothing more than to take its mineral resources, a continent run by a wealthy, power-hungry, feuding and feudalist elite, where a nation with the most advanced tech and weapons in the world nonetheless has no thinkers to develop systems of transitioning rulership that do not involve lethal combat or coup d'etat. In fact, Wakanda is very like the usual portrayals of Africa, right down to her invisible residents. Other Marvel cities are peopled by many ordinary Joes, from policemen to high school students to retirees and the super-rich, all of whom, at least theoretically, have some chance of becoming superheroes. Wakanda, on the other hand, is about royalty and warriors. Its wealth does not come from the ingenuity of its people but from a lucky meteor strike and the benevolence of its all-wise rulers. This is a vision of Africa that could only spring from the neocolonial mind. It is really telling how close a black "redemptive counter-mythology" sails to the colonial vision of a childish people needing a strong guiding hand to lead them. Despite their centuries of vibranium-induced technological advancement, the Wakandans remain so remarkably unsophisticated that a "returning" American can basically stroll in and take over, just as 19th-century Europeans did to the real Africa. "Black Panther" may be a rare feel-good movie for black folks in America, but it should not be mistaken for an attempt at liberating Africa from Europe. Quite the opposite. Its redemptive countermythology entrenches the tropes that have been used to dehumanize Africans for centuries. 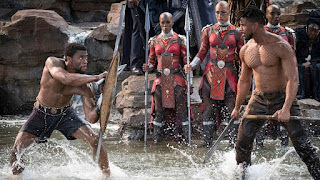 The Wakandans, for all their technological progress, still cleanly fit into the Western molds, a dark people in a dark continent. In truth, the Africa of Hollywood's imagination is not much different from that of the Chinese one. This month, a show celebrating the Lunar New Year on the Chinese state broadcaster CCTV had a skit set in Kenya featuring a Chinese actress in blackface and fake massive buttocks, African actors in monkey costumes and hordes of other grateful blacks gushing: "I love China!" The stereotypes are reminiscent of the 2017 runaway blockbuster "Wolf Warrior 2," the Chinese version of the "white savior," in which the main character, a soldier named Leng Feng, battles American mercenaries in a war-and-disease-ravaged Africa filled with infantilized, dying Africans. For many Kenyans, this is familiar territory that Hollywood has traversed for many decades with titles such as "Out of Africa" and "The Constant Gardener." 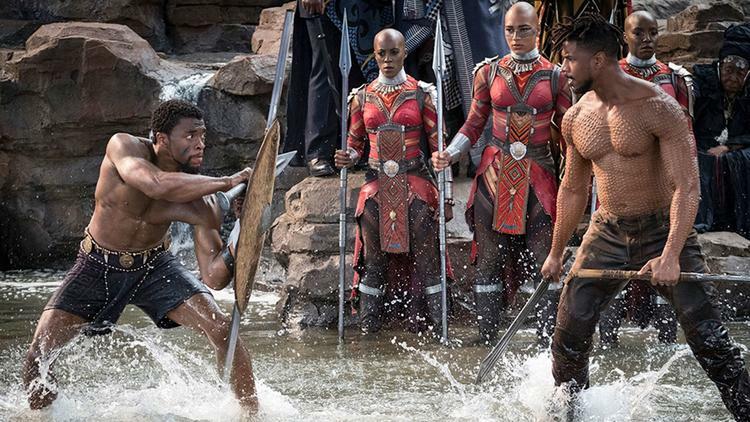 If "Black Panther," with its 90 percent black — if not exactly African — cast, was supposed to lead the way toward a more decent portrayal of the continent and its denizens, it clearly doesn't. However, apart from its cliched beautiful African sunset, the movie may have a silver lining if it makes us worry less about the portrayal of Africa and think more deeply about the portrayal of Africans. After all, the very idea of Africa itself is largely a European and American invention. "Africa — or, rather, 'Africa' — is a creation of a white world and the literary, academic, cinematic and political mechanisms that it used to give mythology the credibility of truth," writes Cobb. The word came to encompass the whole continent from the end of the 1st century B.C. as European appreciation of the size of the place grew. As it did so, it was paradoxically divorced from the predominantly Arab north that it had been attached to before. According to Paul Tiyambe Zeleza, vice chancellor and professor of humanities and social sciences at the United States International University-Africa in Nairobi, the conflation of Africa with sub-Saharan Africa "ultimately offers us a racialized view of Africa ... as the 'black' continent." "Africa" was no longer a geographical entity, but was imbued with ideas of blackness and a mystical cultural unity. The trans-Atlantic slave trade and colonialism served to spread and cement this association abroad, giving rise to pan-Africanism — the idea that black Africans and their descendants belonged to a single "race" and shared both cultural unity and historical fate. European ideas of African similitude included Victorian notions of a continent of childishly simple and primitive people, unsoiled by and needing protection from the complexities of modernity and living in harmony with nature on an Edenic paradise, a bygone society of wizened sagely old men sitting under trees spewing maxims surrounded by overly sexualized women shaking well-endowed butts. Sound familiar? The Afro-futurism of black America, it seems, has little to offer the people of Africa. It cannot engage with them as human beings but, like the white and Chinese worlds, only as props for its own struggles and self-aggrandizement. And, in all fairness, "Black Panther" is not meant for Africans. Perhaps it is not a bad thing entirely that some Africans, such as Kenyan journalist Larry Madowo, do not see themselves in "Black Panther." "The accents are all over the place! It was jarring and annoying to me!" he says. If they did, they might continue to believe that they are doomed to be just like the Wakandans — dreamed up by the West and forever subject to the limitations of others' imaginations. Patrick Gathara is a strategic communications consultant, writer and award-winning political cartoonist in Kenya.